Copyright, 1891, by T. &. Harms & Co. Words by Percy Kingsley. Music by Chas. W. A. Hall. My heart it thrills with ecstasy, a charm by memory cast. As I ponder o'er those happy days, tho' but memories of the past. No weary years can e'er erase those memories of the past. Like some old song and cherished strain, in the music of a dream. 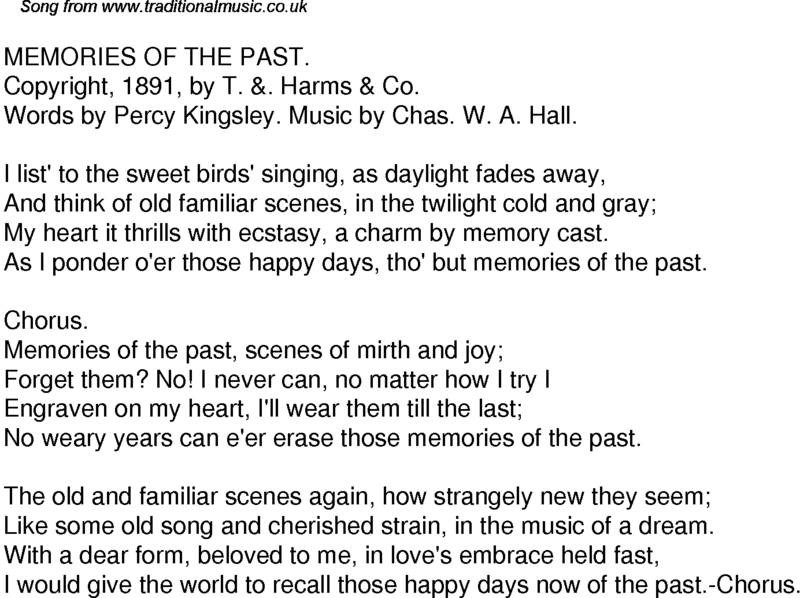 I would give the world to recall those happy days now of the past.-Chorus. Download music lyrics in RTF file For editing / printing with Word and other editing software. Download music lyrics as PNG Graphic file For inclusion in DTP etc.